This article might have come a bit late for its stated title, but it is nevertheless never late for commemorating the life and work of this important, but perhaps much neglected, scholar who was responsible for providing the primary manuscript basis of the Greek New Testament Bible scholars use today. Less than a month ago, the previous year, 2015, marks the 200th birthday of Constantine Tischendorf. Tischendorf was born in 1815 in Saxony, and he largely worked in the area of New Testament textual criticism, spending most of his scholarly career at the University of Leipzig. He became well known for his discovery of the famous Codex Sinaiticus in St. Catherine’s Monastery at Mount Sinai, and, to a lesser degree, for his deciphering of a fifth-century Greek palimpsest manuscript, Codex Ephraemi Rescriptus. Despite his monumental discovery of and work on these two major codexes of the Greek New Testament, there have been controversies over Tischendorf’s life and career as a scholar and Bible hunter. One of the contributors of this blog, Stanley Porter, wrote a book and an article to explore and talk about some of the issues involved in these controversies. I provide a brief summary of these two works below, as I believe that what Porter says in them can clarify and add much to our understanding of Tischendorf’s life and career as a scholar and Bible hunter. The timely publication of Porter’s book and article truly commemorates the 200th anniversary of Tischendorf’s birth. 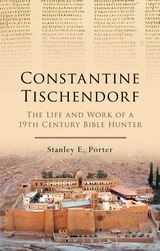 In Constantine Tischendorf: The Life and Work of a 19th Century Bible Hunter (2015), published by Bloomsbury, Porter gives a portrait of the life and intellectual accomplishments of the German scholar Constantine Tischendorf. Porter argues that Tischendorf was a great scholar whose life and work deserve greater attention and merit in New Testament scholarship. It is unfortunate, however, that New Testament scholarship has largely neglected his intellectual accomplishments, especially in the area of textual criticism. Most reference works on major thinkers in the history of New Testament scholarship only mention Tischendorf in passing, giving greater recognition to other contemporary German scholars of the day like G.F. Hegel, F.C. Baur, F. Schleiermacher, W.D. de Wette, and H.A.W. Meyer, and such textual critics as Karl Lachmann, Brooke Foss Westcott, and F.J.A. Hort. Porter notes that this scenario has largely been the result of the main emphasis in New Testament studies on higher criticism over the last 200 years. Tischendorf has not been given a place of prominence, even though his paleographical and text-critical ambitions clearly grew out of his theological concerns with proving and arguing for the genuineness and authenticity of the Gospels. This is clearly seen in his short apologetic work—When Were Our Gospels Written?—of which Porter provides an interpretive summary (along with a reprint of it) in the second part of Constantine Tischendorf. In “Hero or Thief? Constantine Tischendorf Turns Two Hundred,” published in Biblical Archeological Review 41.5 (2015), Porter considers whether some of the negative labels attributed to Tischendorf—looter, treasure hunter, thief, genius, or hero—are fair and accurate. Porter sketches a short biography of the German scholar, and then recounts his ambition to find the oldest extant biblical manuscript, his few expeditions to St. Catherine that resulted in his finding the manuscript at the monastery, and his later and long negotiations with the archbishops of Constantinople and the Russian officials so that he could produce the four-volume facsimile edition of the entire codex. In the midst of Tischendorf’s dealings with the archbishops and the Russian officials, a Russian ambassador named N.P. Ignatieff “used the word ‘stolen’ to describe the Russian possession of Codex Sinaiticus. In order for something to be stolen, there must be a thief…a label that has stuck to the devotedly religious scholar throughout his life and legacy.” But Porter notes that this accusation, along with a few others, is not accurate. In fact, Porter also says that some scholars have come to the conclusion, after studying the documents and literary remains of the transactions involved in the process, that Tischendorf legitimately procured Codex Sinaiticus from start to finish and that he should be exonerated of wrongdoing. At the end of this article, Porter notes the celebration that took place in Lengenfeld, where Tischendorf was born, in honor of his 200th birthday and in recognition of his life and contribution to biblical textual scholarship. This entry was posted in biblical scholars, scholarship, textual criticism and tagged Bible hunter, Codex Ephraemi Rescriptus, Codex Sinaiticus, papyrology, St Catherine's Monastery, textual criticism, Tischendorf. Bookmark the permalink.